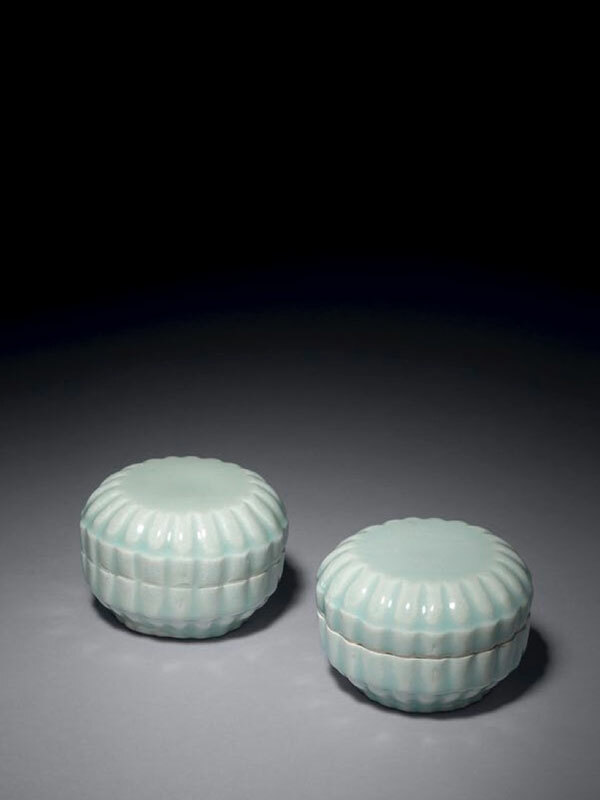 Two small qingbai porcelain boxes, each of compressed circular drum shape. Both the cover and the bottom sections have multi-lobed sides with raised bands around the rims. The slightly convex top of each cover is undecorated. The boxes are covered in a thin, translucent bluish-white glaze, leaving the rims and bases uncovered, exposing the sugary white body, which has a few grit marks adhering to each foot. Each box has two incised vertical strokes in the glaze on the side edges to indicate the correct alignment of both parts. The elegant multi-lobed shape of these boxes exemplifies the simplicity of Song aesthetics and was most probably derived from lacquer or metal wares of the Tang (618 – 906) and Song periods. A nearly identical, slightly lower qingbai porcelain box of the same shape and diameter was excavated from the Hutian kiln in Jingdezhen between 1988 and 1999 and is now in the collection of the Jingdezhen Museum of Civilian Kiln. Another larger, but in terms of design closely comparable, qingbai box is in the Yuegutang collection in Berlin.